3 Head Paradox: Ribbit ribbit ribbit ribbit ribbit ribbit! Here's something I learnt the other day. 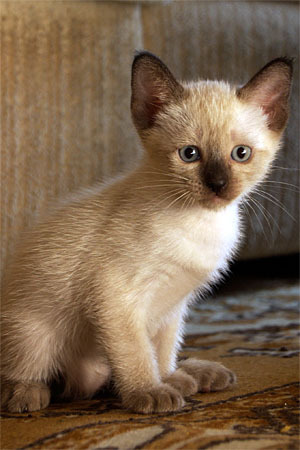 You know the distinctive colour patterning of Siamese cats? Where most of the coat is a light fawn colour, while the tips of the tail, feet, ears, and part of the face are dark, almost black. Here's a good example, courtesy of Cindy McCravey, released under Creative Commons-Attribution 2.0 Generic. This sort of colouring pattern is known as sealpoint. The "seal" refers to the colour - a very dark chocolate brown, almost black, like a seal. The "point" refers to the "points" of the body - those parts at the extremities. What you might not know is that when such cats are younger, the colouring of the extremeties isn't so dark. Here's a younger sealpoint Siamese cat, courtesy of Zsolt Vajda, released under Creative Commons-Attribution-NonCommercial-ShareAlike 2.0 Generic. Notice how the nose and in particular the toes aren't nearly as dark as the grown cat, and the dark colouration isn't as widely spread across the face and up the legs. Yet when this kitten grows up, it will look very similar to the cat above. What do sealpoint cats look like at birth? Here are some, courtesy of Lisa Linn, released under Creative Commons-Attribution-ShareAlike 2.0 Generic. 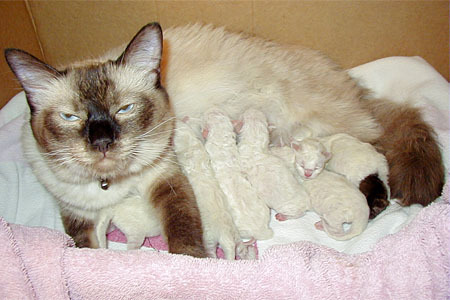 Notice how the mother cat shows the sealpoint markings, but the newborn kittens are completely white, with pink skin showing on the noses, ears, and toes. This is not because the father cat was white or anything - these are true sealpoint kittens and they will grow up to look much like their mother. What is going on here? The sealpoint colouring pattern is genetically determined. It is in fact a variant form of albinism, in which a gene triggers a mutation in the form of the enzyme tyrosinase. Tyrosinase is a catalyst enzyme responsible for the production of the pigment melanin, which gives many animals dark colouration. If the tyrosinase doesn't work at all, the animal won't produce melanin, and will be an albino - pure white in colour. However, the sealpoint mutation produces a form of tyrosinase that is heat-sensitive. It works properly when it's cool, but switches off when at warm temperatures, in particular around the normal internal body temperature of a mammal. When in the womb, a sealpoint kitten is unformly snug and warm. The tyrosinase is thus in its switched-off state, and doesn't produce any melanin. This means that the kittens have no pigmentation when born, and emerge into the world snowy white. As soon as they enter the world, however, the tips of their tails, ears, and feet start to cool down closer to the ambient temperature. The central parts of the body remain warmer. 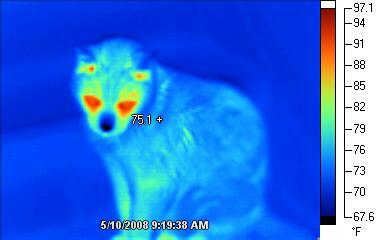 Here's a photo of a cat taken with an infrared thermal imaging camera, courtesy of cd_1940, released under Creative Commons-Attribution-NonCommercial 2.0 Generic. So, the tyrosinase in the cat's body therefore cools down near the extremities, where it starts working properly and generating melanin. So the pattern of colouration across the cat's body matches the distribution of its body temperature! That's not all, either. Here is a pair of sealpoint Siamese cats, courtesy of Elissa Ernst, released under Creative Commons-Attribution-NonCommercial-ShareAlike 2.0 Generic (left), and NH53, released under Creative Commons-Attribution 2.0 Generic (right). 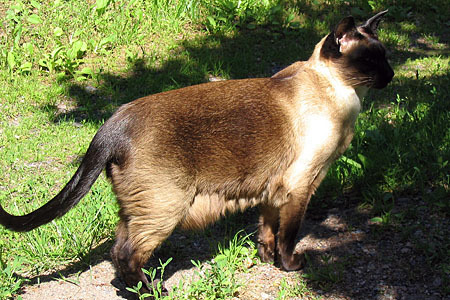 I found the left cat photo by searching Flickr for Creative Commons photos of Siamese cats taken in Finland; it was the only hit. 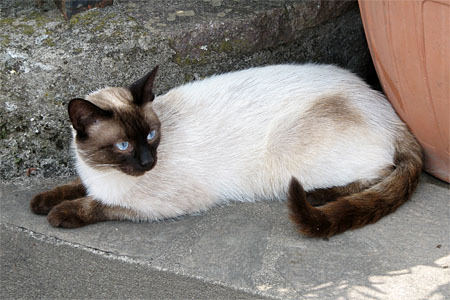 The second cat is the first hit for Creative Commons photos of Siamese cats taken in Italy. I didn't do any picking or choosing to get these examples, apart from picking two countries with different climates. In Finland, it's much colder than it is in Italy. 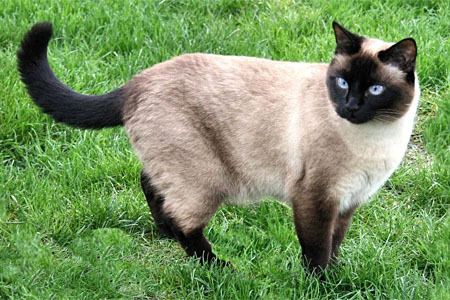 So, the Siamese cats there have more of their tyrosinase activated across their bodies, and end up being darker in colour. Probably some of you knew all of this already. (I'm always pleasantly surprised at the breadth of knowledge exhibited by the readers of this comic.) But hopefully I've shown the rest of you something amazing about the world we live in. Last Modified: Thursday, 21 April 2011; 03:11:01 PST.